Tikhon of Zadonsk was born to poor peasants in Russia in the 18th century. He was a gifted and intelligent child who would grow up within the loving arms of the Church. His talent and intellect were identified early and, after feeling a call from God to service, he was encouraged to pursue a clerical life. For Tikhon, he understood his calling as being to the monastic world. His strong desire to be a monk made other vocations unappealing to him, at first. His intellect and earnestness earned a scholarship for him to attend seminary and so he did. At the age of 30, he was ordained a priest. As a recently ordained priest, it is likely that he was joyful of his indubitably imminent calling as a monk and mystical servant of God in some distant and disconnected monastery. This was, for sure, a high calling and one that Tikhon was suited for given his desire to pray and increase the spiritual quality of the surrounding people. Further, Tikhon desire silence and solitude so that he might have peace and comfort in a busy world full of hurting people. And, yet, this was not where Tikhon was assigned. Instead, he was assigned to teach theology. Many people may have railed against the power structure of the Church at this point and insisted that God had called them to a monastic life. It wouldn't be surprising if Tikhon refused to serve in a position where he wasn't comfortable. Instead, though, Tikhon became a teacher of theology and devoted himself to doing it well even if it wasn't enjoyable for him, at first. Though he became a gifted theologian, he still harbored a strong calling to the monastic life. Seven years later, he was called as bishop of Novgorod. He protested that he felt this wasn't the best use of his skills and reminded his mentors that he felt called to the monastic life but they insisted that they needed him--the Church needed him--as a bishop. This is an odd experience given that many priests have eagerly sought this kind of power. Rather, Tikhon was seeking the solitude and life of prayer that he had, initially, felt called to. He did, however, consent to be bishop. 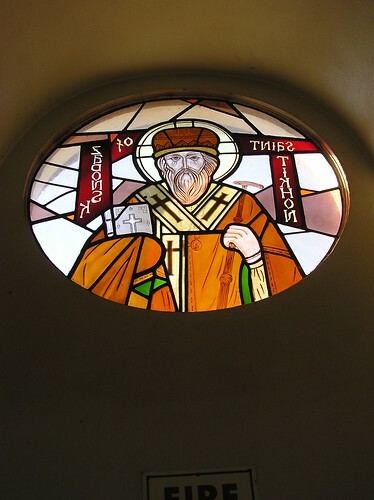 Tikhon was a gifted and skilled bishop. He would go on, two years later, to become the Bishop of Voronezh. He was highly respected as a leader and holy man. His priests looked up to him as a mentor and inspiration. Through his work, he strengthened the spirituality of not only the clergy in his congregations but, also, the families and lay-people under his care. Further, Tikhon couldn't see how poverty was still possible within a land so saturated by the Church. Once, he wrote: "There ought to be beggars and destitute persons no longer. All should be equal." In Tikhon's estimation there was plenty of ministry to be done within the Church even as the Church was doing ministry for those without it. Several years later, Tikhon became ill and was, finally, allowed to enter a monastery near Zadonsk. Though Tikhon had served wherever God had called him, he was finally at the place that God had initially called him to. Often, we forget about the path between us and our eventual goal and forget that God has called Christians to be ministers along the path and not just at the goal. For Tikhon, happiness was found in the simplicity and regularity of the monastic life among poverty-stricken peasants. As a monk, he kept an open door and--perhaps because of the path he took--it was always well used. People came seeking Tikhon from all around and seeking spiritual formation and counsel. As a minister of God--regardless of current location or perceived calling--Tikhon offered this to any who would come. Tikhon grasped something that so many of us miss: to be a minister of the Kingdom of God is not about place or profession but, instead, is about being a different kind of person--clerical or lay--in a world that detests difference and blessed assurance. Tikhon is, ultimately, wrapped up in his own quote: "For love does not seek its own, it labors, sweats, watches to build up the brother: nothing is inconvenient to love, and by the help of God it turns the impossible into the possible...Love believes and hopes...It is ashamed of nothing...As an animal cannot exist without bodily warmth, So no good deed can be alive without true love; it is only the pretence of a good deed." Tikhon got it. Tikhon understood that the Christian life is about the everyday living and loving and not about works or accomplishments. Tikhon of Zadonsk was, truly, called and, truly, willing to follow.